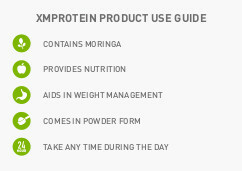 Zija's XMprotein is a tasty lean protein shake, packed full of Moringa nutrients. 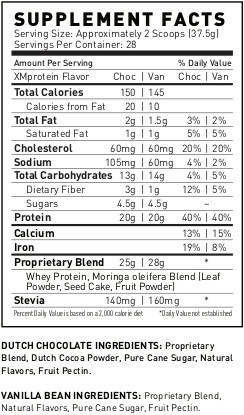 Zija's XMprotein Dutch Chocolate, or Vanilla Bean offers you the essential nutrients found in Moringa, maximum bioavailability of protein and full amino acid sequencing. It seems to surpass any other meal replacement or protein supplement product of its kind. The whey in Zija PR1ME90 XMprotein Mix is NOT genetically modified, chemically altered, enzymatically dead, preserved, chemically stabilized, colloidally altered, hydrogenated, isolated, caseinated, acidified, or hydrolysated. Zija XMprotein Weight Management Get healthy, and lose weight with this great tasting protein shake. Add 2 scoops (37g) to 600mL of cold water or milk and mix well. 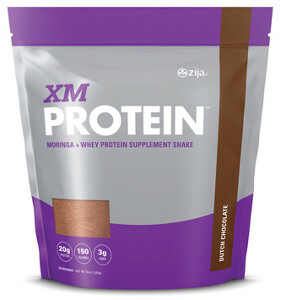 Drink one serving of Zija XMprotein Dutch Chocolate or Vanilla as an alternative healthy meal. One bag of XMprotein meal replacement contains enough mix to make approximately 28 delicious shakes.